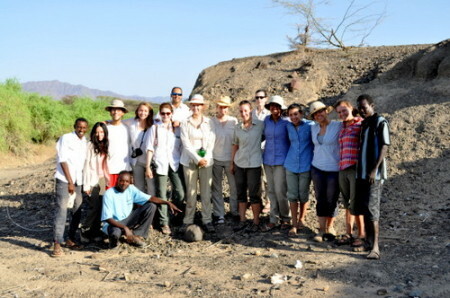 On Thursday, the students set off an a camping adventure to Nariokotome. The truck and the pick-up were packed with bed-rolls, tents, cooking equipment,wash-tubs, and enough food to feed a small army of archaeology students for the next three days. The students also made their own preparations, taking notebooks, academic articles and a good book to read on the journey, swimming costumes for a dip in the lake, the occasional cuddly teddy-bear for a night-time companion, and a healthy measure of excitement. On the way, we stopped at the Namuratunga Archaeological Site, one of the many pillar sites dotted around the Turkana Basin Region. 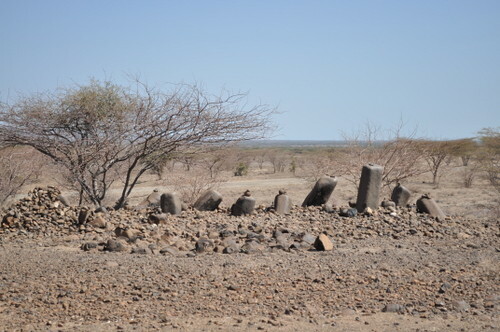 Commonly known as the Dancing Stones, these monuments are thought to have been erected in the early days of pastoralism at a time of many socio-economic changes; but their function and significance is still poorly understood. 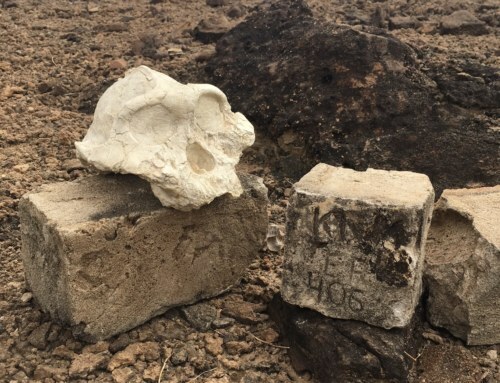 Some archaeologist have hypothesized they may have had some religious or astrological purpose, while others have highlighted their use as burial sites. 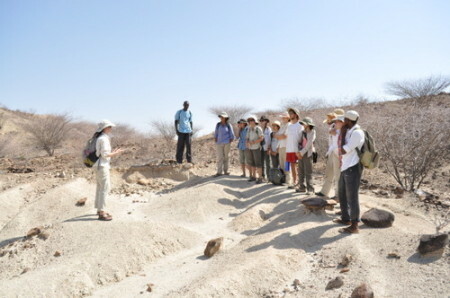 At the site, Dr. Sonia Harmand discussed with the students these various theories and explained that while their nature may still remain a mystery, the pillars have found a home in the modern Turkana culture and have lived on in folk tales and the custom of placing a stone atop the pillars when passing by. 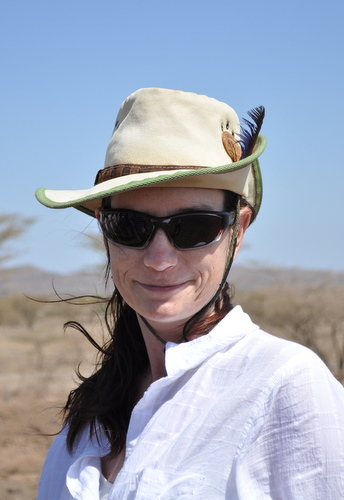 Dr. Sonia Harmand at Namuratunga. The next stop was the complex of Lokalalei. 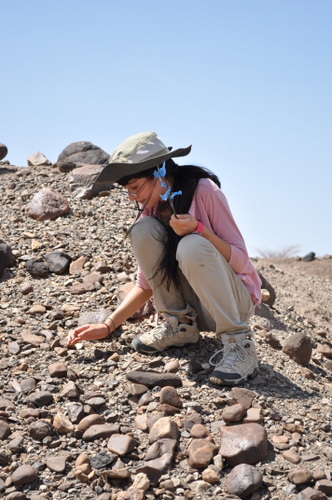 The sites here were excavated by Dr. Harmand and her team a few years ago when she made an amazing discovery – Lokalalei 1 and 2c yielded two very different styles of Oldowan. While Lokalalei 1 presented very low quality tools with evidence of many knapping accidents, Lokalalei 2c presented an Oldowan assemblage that indicated very skilled knapping, including the ability of removing 73 flakes from one single core! These findings suggest that the Oldowan was not necessarily a static and simple technology, but one that was much more dynamic and very diverse. The students heading to Lokalalei 2c. At Lokalalei 2a and 2b it was time for the students demonstrate their own tool hunting skills. Dr. Harmand distributed colourful flags between the students and they all lined up along the ridge to begin their transects. At Lokalalei 2a and 2b the students start flagging some Oldowan tools. 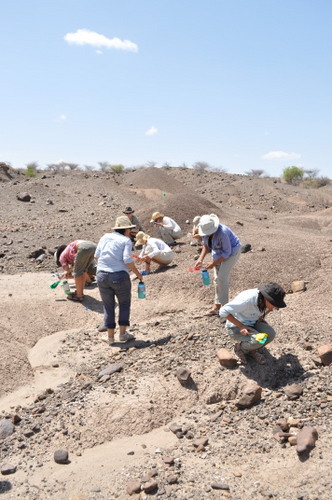 Noses to the ground, they began to find cores, flakes, hammerstones, choppers and chopping tools of many different shapes and sizes. And also some things that looked like tools, but, after close inspection by Dr. Harmand, turned out to be merely geofacts. Lauren inspects the ground closely. 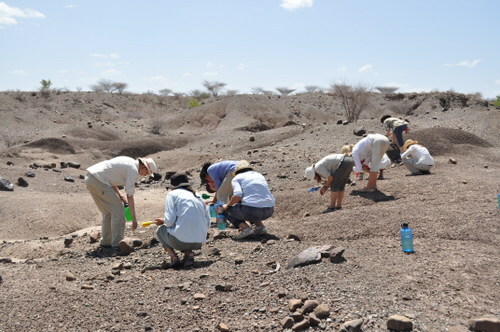 While Francis has a look at what the students have found so far. After a long but fun day out, the students arrived at camp where tea and biscuits were waiting. It was then time to pitch the tents, have some dinner and quick bucket-shower by the waterhole, and a good nights sleep. The next day, the students woke up to the sound of a heard of goats bleating their way through camp, doing the kind of things goats do – trying to munch on whatever they could find. A view of the camp on the morning of day 2 (click to enlarge). 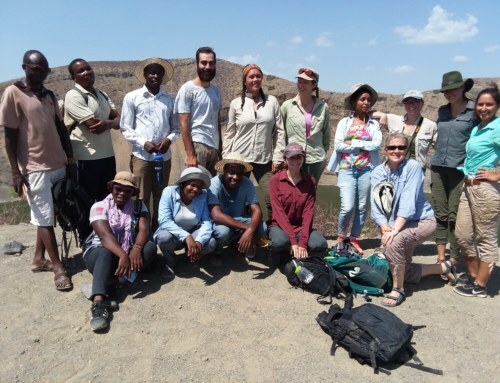 After breakfast we set off to see one of the most famous hominin sites in the world – Nariokotome, the site where Turkana Boy was found. As the story is often told in textbooks and documentaries, in 1984 a team of fossil hunters lead by Richard Leakey were doing some surveying in the Nariokotome area where, one day, Kamoya Kimeu stumbled across a hominin fossil when taking his morning stroll. 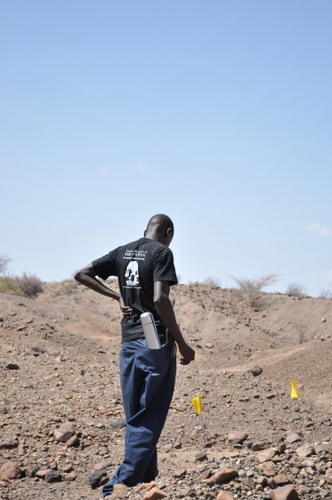 Subsequent excavations uncovered the most complete Homo erectus skeleton ever to be found. Francis and Sami, who, as young boys, were witnesses to these events, brought the story to life as the students listened attentively. 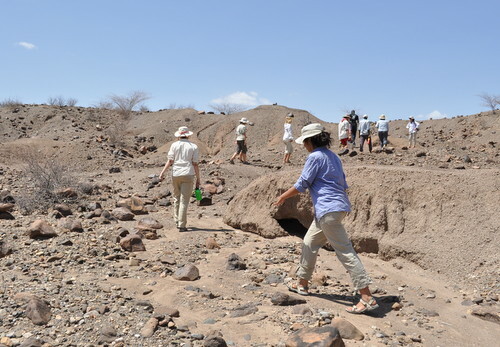 It was now time to return to the truck and proceed to Kokiselei where the West Turkana Archaeological Project team started to excavate in the early 2000’s. Kokiselei is a complex of Early Stone Age sites all dated to around 1.76 million years ago all with their own peculiarities. 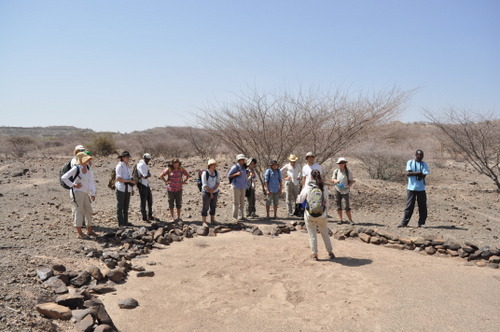 Dr. Harmand took the students on a guided tour of the sites starting at Kokiselei 1 – an Oldowan site with a unique geological phenomena that caused all the stone artefacts to acquire a chalky white appearance on the outside. Dr. Harmand introduces the students to Kokiselei 1. “Is it an artefact of a geofact?” Robyn asks Dr. Harmand about the phonolite she found. Kokiselei 5, also know as the “swimming pool”, is also an Oldowan site, but one so well preserved that the archaeologists could determine it was a knapping site AND, based on the spread of the assemblage, they could identify exactly where the knapper(s) were positioned when they were making the stone tools. Pretty amazing! The next stop was at Kokiselei 4, the oldest Acheulean site to be discovered so far. 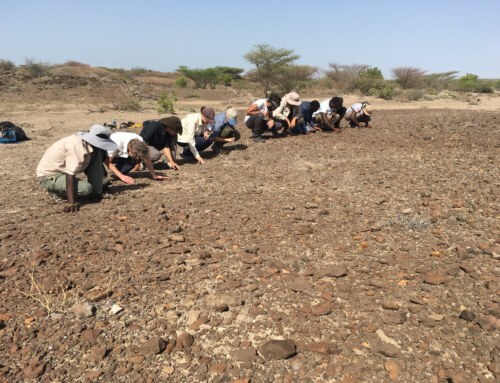 Here the students were let loose to explore the site and practice identifying the different stone artefacts of the Acheulean. 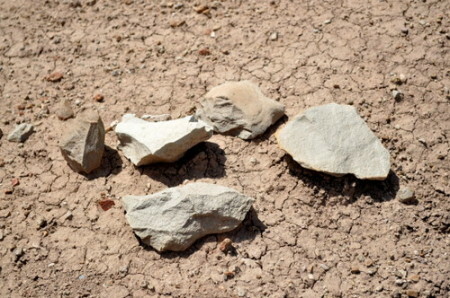 An assemblage of Acheulean stone artefacts. Angela describes the artefact she is holding. “This one is a tough one” – says Abdi. After a hot morning, it was time to head to the lake shore for a refreshing swim. On the way, we stopped at the Kokiselei Laga for the students to collect their own raw materials – phonolite cobbles and basalt hammerstones to take back to TBI for knapping later in the week. Going for a swim in the lake. 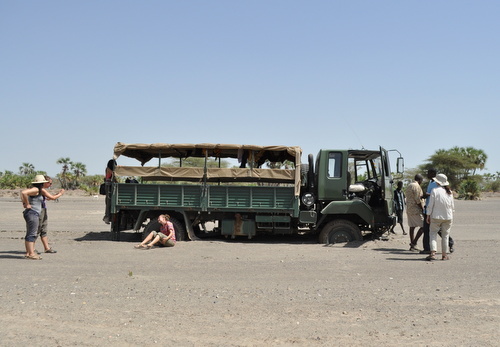 As we were returning back to camp, disaster struck and the truck got stuck deep in the sand. Luckily the small pick-up was close at hand so we were able to take the students back to camp and pick up a few extra hands to dig out the truck. 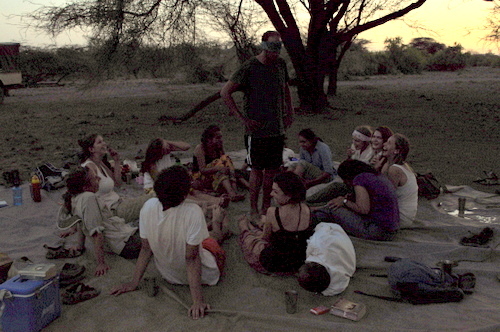 By evening everyone was back at camp safely and it was time to relax after a very eventful day. The students having a good laugh as they play “Squeak piggy squeak”. Time to pack up and head back to TBI. Just one last stop at Nadung’a to collect some blocks of green and red rhyolite to add to the raw material collection; and then it was time to go home. 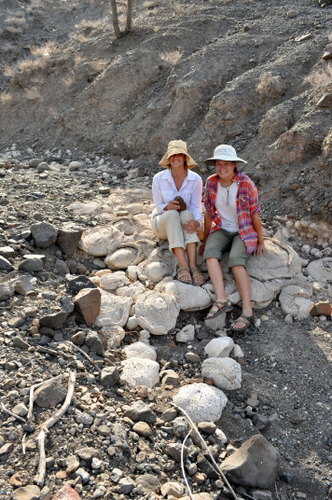 Robyn and Kailie on a bed of stromatolites at Nadung’a. 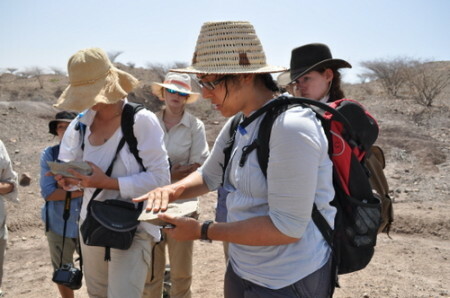 Janina and Lauren sort out the rhyolite in the truck. 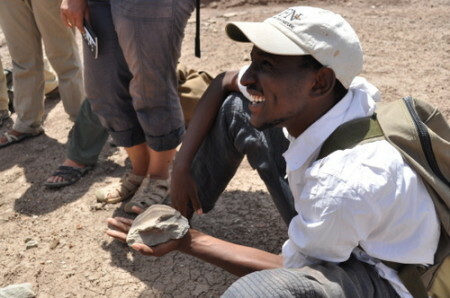 They were three fun-packed days adventuring into the northern end of the West Turkana Region. 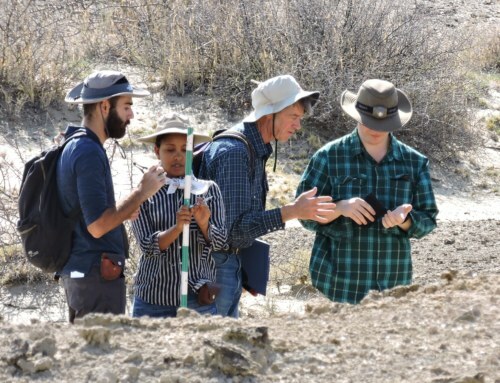 After learning about them in class, the students got to see for themselves many of the significant sites that have been key to the hominin story and have brought us closer to our understanding of how we evolved physically, behaviourally and cognitively into who we are today. They were also able to get a small glimpse of the knapping minds of Stone Age hominins while making choices on what raw materials to collect for successful knapping later in the week – we shall see how our young hominins faired in the next post. 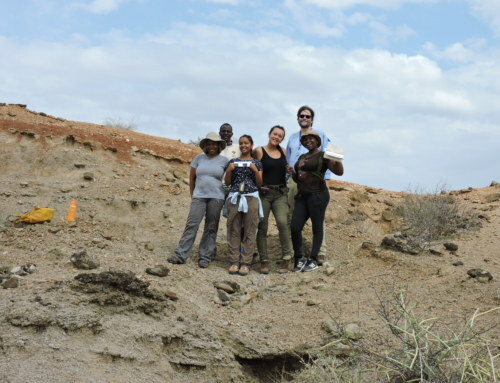 Check back soon for more exciting news from the Spring 2014 Field School!